In 1993 moved to Tel-Aviv. While making his living playing mainly Jewish music Asaf continued to develop his own voice as a drummer and composer until, in 1995, formed his own trio (featuring Kobi Arad on Keyboards and Gabriel Mayer on Bass) and recorded his first solo album ‘One Step Closer’ (independent). In 1996, Inspired by French Church Organ composers such as Olivier Messiaen, Maurice Durufle’ and Cesar Frank he formed a unique new band ‘The Inner Noise’ consisting of Church Organ, Electric Guitar and Drums (with Adi Goldstein on Organ and Amir Perelman on Guitar). The Inner Noise’s first project was commissioned by the Tel-Aviv City Council and was performed around Israel in 1997-8. In October 1998 Asaf left Israel to Europe and eventually settled in London in April 1999. He soon become part of the UK Jazz and world music scene, and started working with Adel Salameh, a Palestinian aud player/composer with whom he recorded the album ‘Nuzha’ which featured Asaf’s Middle Eastern frame drum playing. Soon after arriving in the UK Asaf re-formed the Inner Noise band with Steve Lodder (Church Organ) and Mike Outram (Guitar). In 2000 Asaf met Gilad Atzmon, which was the start of a major creative collaboration. With Atzmon they formed The Orient House Ensemble, and this band went on to record 7 albums (‘Orient House’, ‘Nostalgico’, ‘Exile’, ‘Musik’, ‘Artie Fishel & the Promised Band’, ‘Refuge’, and 'In Loving Memory Of America'). OHE’s album 'Exile' won the 'Best CD of the Year' category at the BBC Jazz Award 2003 and nominated for the ‘Best Band’ category in 2004. Asaf performed with The OHE in many prestigious festivals and venues in the UK and in Europe until April 2009 when he left the band to focus on his own writing and work with his trio. In 2006 Asaf started a unique collaboration with the highly acclaimed saxophonist/composer Tim Garland and has enjoyed making seven albums with him so far; notably 'The Mystery' (featuring Chick Corea and the Northern Sinfonia Orchestra), 'Lighthouse' (released on ACT, featuring Gwilym Simcock on piano), and 'Songs For The north Sky'. Asaf has tours around the world with Tim's various projects. With the Inner Noise band Asaf made two more albums, ‘We Are Falling’ (Konnex 2005) and ‘The Song Within’ (SAM Productions/Egea 2007) which was selected as one of the best albums of 2007 at the ‘All About Jazz’ web-site by John Kelman. While developing his own compositions, Asaf formed the Asaf Sirkis Trio in 2007 which features Greek guitarist Tassos Spiliotopoulos and Israeli bassist Yaron Stavi. This trio has released three albums; ‘The Monk’ in (SAM Productions/Egea, 2008), 'Letting Go' (Stonedbird Productions, 2010) and 'Shepherds Stories' (2013, Stonedbird Productions) which has been selected twice as one of 2013's best Jazz albums of the year at the All About Jazz website. Since 2014, Asaf has been co-leading the SIrkis/Bialas IQ together with Polish composer/singer extraordinaire Sylwia Bialas (with Frank Harrison on keyboards & Kevin Glasgow on bass). Their debut album 'Come To Me' has been receiving some rave reviews and been selected as one of the best of 2015 by Mark Sullivan at the All About Jazz website. In recent years Asaf has been studying Konnakol - the south Indian vocal percussion language - with master mridangamist Paramasamy Kirupakaran and has been integrating this system in his teaching, composing and rhythmic approach. Asaf has developed an easy, step-by-step method of practicing Konnakol that can help any western instrumentalist or vocalist of any musical genre and level to increase rhythmic awareness and focus. Nowadays, Sirkis is involved in a variety of educational work, bringing Konnakol as a useful tool of understanding rhythm to western music education. Notably he has given many workshops and seminars around the world on the subject and has a YouTube channel with some basic Konnakol tutorials. 2017 has been a very busy year so far; Recording many albums for the Moonjune record label (U.S.) with international artists artists such as Dwiki Dharmawan (Indonesia), Mark Wingfield (UK/USA), Dusan Jevtovic (Serbia/Spain), Nicolas Meier (Switzerland/UK), Gilad Atzmon (Israel/UK), Markus Reuter (Germany), and more. Asaf is featured on Tim Garland's new album 'ONE' (album of the year on Jazzwise magazine) and looking forward to touring with that band throughout 2017. Asaf has also been touring with Arabic singer Natacha Atlas' band. With the Sirkis/Bialas IQ - The band has been touring the UK playing all new music composed by Asaf and Sylwia Bialas and will be recording a new album this summer. 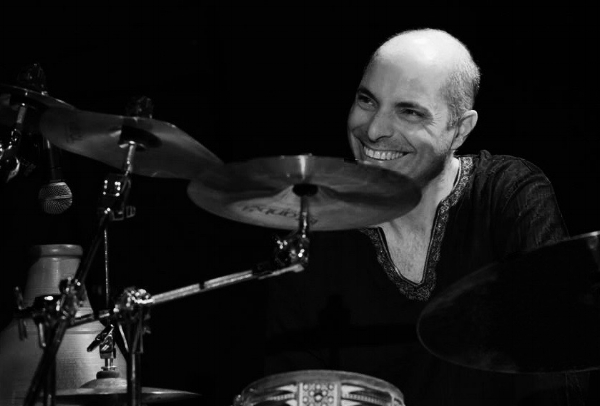 Born in Israel, Asaf started his professional career as a drummer in the late 80's and played with some of Israel's Jazz luminaries such at Harold Rubin and Alber Beger. A few years after the recording of his first solo album 'One Step Closer' Asaf relocated to the Netherlands, France and finally settled in London around 1999 where he soon became one of the most active Jazz drummers around. During that time Asaf became a founder member of Gilad Atzmon's ‘Orient House Ensemble’ and started his long time collaborations with renown saxophonist Tim Garland and pianist Gwilym Simcock. Asaf has been leading his own bands and projects such as 'Asaf Sirkis & the Inner Noise' - a band of an unusual line up of church organ, guitar and drum as well as the Asaf Sirkis Trio. He has been touring worldwide and recorded over 100 albums as a sideman, collaborator and as a leader. Asaf have been playing with many renown jazz and world music artists such as: Dave Holland, Jacob Collier, Tim Garland, Gwilym Simcock, Larry Coryell, Jeff Berlin, John Abercrombie, Bob Sheppard, Norman Watt-Roy (off the Blockheads), Wilco Johnson, Soft Machine, Robert Wyatt, Natacha Atlas, Dave Liebman, David Binney, Gary Husband, pianist John Taylor, Norma Winstone, Kenny Wheeler, Andy Sheppard and many more.